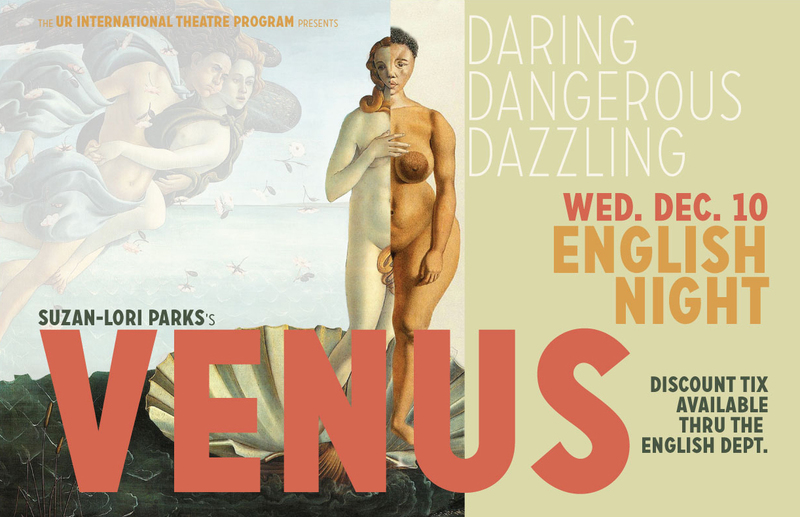 English Night at Todd Theatre: Venus will take place on Wednesday, December 10. Theatregoers may book discount tickets for English Night by calling the English Department at 275-4092, or by mentioning UEC at the box office. English Night is sponsored by the Undergraduate English Council and the Department of English. After the show, there will be an opportunity to meet the cast over refreshments in Todd Lobby. The International Theatre Program’s production of Venus will run through December 13th. In Suzan-Lori Parks’ highly theatrical, historical drama, Venus, the “Venus Hottentot,” a young Black woman in 1810 South Africa, is whisked away to England under false pretenses and sold to a freak show. After achieving great success for her employers, she attempts to make it on her own, but love and economics collide when she becomes the mistress of a white doctor. Unforgiving, humorous and tragic, Parks deftly blends theater of the absurd and romantic realism to question the perceived value of a black woman's body in a white world. For tickets and detailed showtimes and information, visit the Todd website at www.rochester.edu/theatre.